It wasn’t so long ago that owning a convertible meant putting up with a variety of inconveniences including clumsy, complicated tops, the wind making a racket in the cockpit through gaps that developed in untight seals and having to take the vehicle off the road in winter lest the cloth roof warp and crack, which it usually did anyway. Lexus helped bring a revolution with their SC 430 hard top convertible in 2002, enabling enthusiasts to drive all-year round, even in snow. Other manufacturers followed suit and now hardtops are here to stay. Their design has only improved through the years. Though the IS 350 seems to have been named by “Seinfeld” star George Costanza, who famously suggested calling a baby “Seven,” this model is one of the most perfect specimens of sport convertibles on the market today, including Benz, Audi, Infiniti, and the rest in its class. There was no task asked of it that it didn’t perform, no tight corner where wheels didn’t firmly hold the road (thanks to a new multi-link design) its cockpit is tight and efficient and visibility with the top up was reasonable, unlike some convertibles. 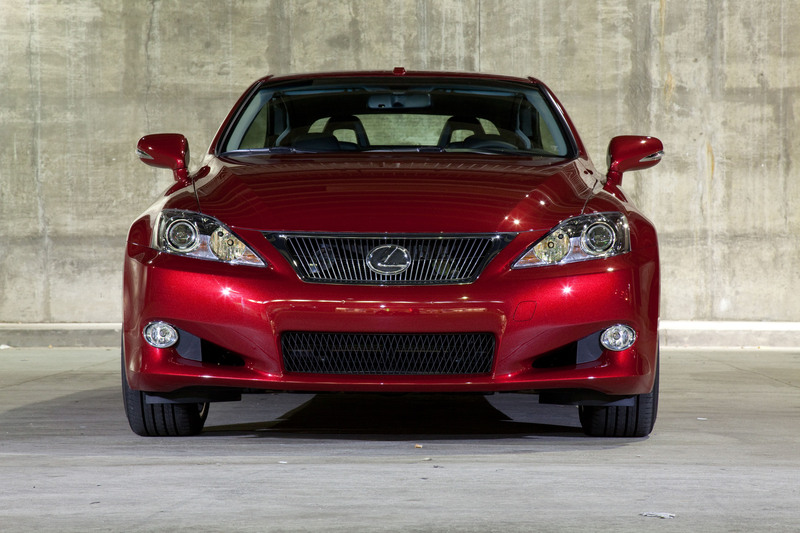 It’s handsome as hell and my red tester got plenty of looks in town – not from just dentists and accountants, either, as the cliché about Lexus buyers goes. Its Mark Levinson premium audio system with 12 speakers is one of the richest I’ve ever heard, and it’s part of a $3,520 navigation package including backup camera, destination assist and more. Other options include headlamp washers ($100) and an F-Sport package for $2,550 providing an upgraded suspension, sport pedals, aluminum scuff plates, sharp-looking 18-inch F-Sport dark graphite alloy wheels, sport steering wheel and shift knob and more. I was a little surprised to read that the IS 350 has 306 horses under the hood, mated to a 6-speed automatic transmission. That size engine in a small car usually produces slightly more angry bursts of speed with accompanying growl during startup and passing. Not that the car was sluggish – it just wasn’t the monster I was expecting. Also, keep a firm foot on the brake if you’re in stop-and-go traffic – more than twice, when I thought I had the car stopped, it was actually inching forward and required a heavy foot. 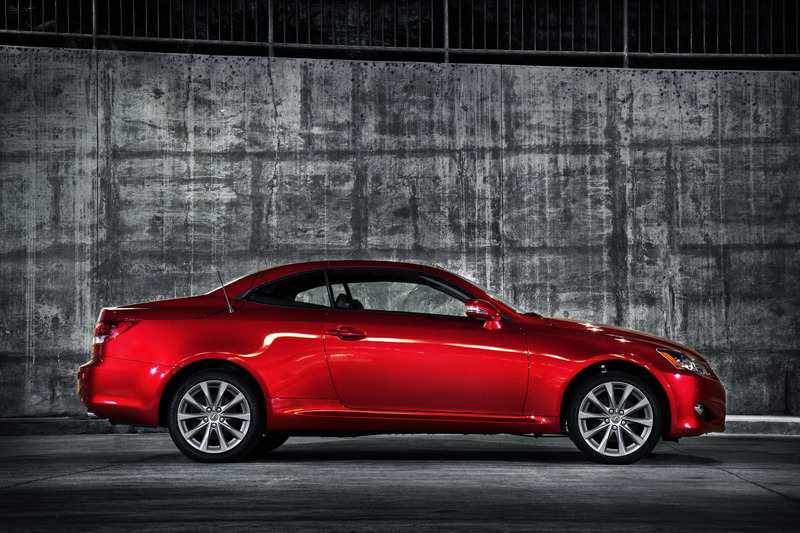 Small beefs aside, Lexus continues to do hard top convertibles right and the IS 350 is a hot car for spring and summer.